Review: The Great Heartland Hauling Co.
Last November, a member of my game group, picked up a copy of The Great Heartland Hauling Co. from the prize table of a convention we were attending. On the way back from the table, he had several people mention to him that although nobody had taken the game up to that point in the prize giveaway, that it really was a great little game. After the convention he took it home and played a couple times and brought it to game night to share and I’ve got to completely agree. Heartland Hauling packs a huge amount of game in the little VHS tape-sized box. Players take on the role of a trucking company in this pick up and deliver, set collection game. 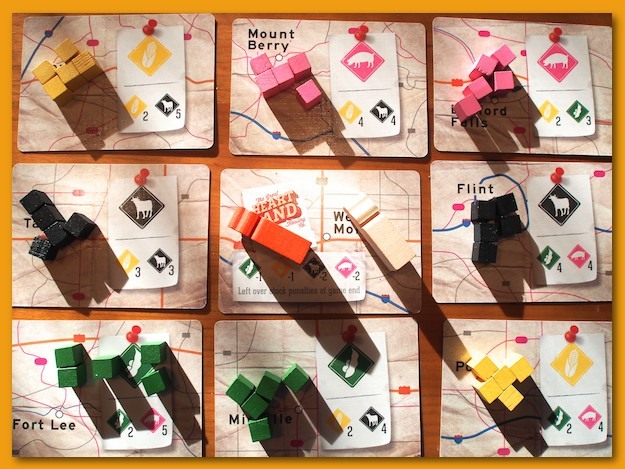 Each player starts with some money (marked by the position of a cube on a personal card) and each turn you first must move your truck from one card (a city) in the common tableau (map) to another card. You perform this action by either playing “gas” cards from your hand *or* paying money from your personal card (move your cube back). Once you arrive at your location, you can either pick up goods (load your truck) or deliver goods (unload your truck), or discard cards for $1. There are four types of goods available, beans & corn, and pigs & cows. There are less pig & cow cards in the deck but they’re worth more (usually) when you deliver so it can be a bit of gamble to focus on them too much. Cubes are loaded by paying matching cards from your hand and you pick up cubes setting on the card and put them into your truck (placing them on your personal “truck” card). Cubes are delivered in much the same way, by discarding matching cards from your hand. After performing your action, you refill your hand back up to five cards from blind draws and/or from a face-up tableau of three cards. Delivering cubes pays out money (move up your money cube) based on the values shown on the card. Cities (cards) produce specific kinds of good and only accept two kinds of goods at various prices so you’ll want to find the most efficient way to travel around on the map to pick up and deliver goods to the cities that pay the most for your goods. The first player to earn a specific amount of money (based on the number of players) triggers the end game and then all other players get one more turn. Players receive negative points for ending the game with undelivered goods still in their truck and the player with the largest amount of money at game end wins. I’ve played with the entire range of players (2-4) and it scales really well. Lisa and I have been having a blast playing it with two. For us, it scratches about the same itch as Morels does but it’s a bit more gamey. It’s a fast-paced race to earn points (money), but as players get near the end-game trigger, there can be a lot of finagling with spending money rather than playing fuel cards in a mad dash to unload remaining goods without triggering the end game until one is really ready to. A lot of that ability depends on the cards. So, don’t expect to be able to be in complete control of your destiny as getting lucky on card draws can be *very* nice or *very* painful! All in all, Heartland Hauling is a great little game and it’s firmly taken a strong position in our go-to 2-player line-up. Author mattPosted on February 15, 2015 January 27, 2016 Categories All Posts, Board GamesLeave a comment on Review: The Great Heartland Hauling Co.